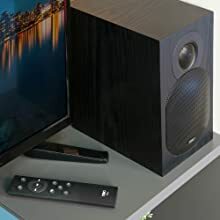 A set of speakers that are designed for the modern day with native bluetooth but sufficiently adaptable to be used with a wide range of hardware including pcs, tablets, media players including blu-ray, tvs and some current turntables thanks to extra connectivity in the form of toslink (optical), rca audio, 3. 5mm audio jack plus the option to add a sub-woofer. By adding an optional component from tibo’s bond range of streaming devices, they can combine to provide a full range of internet radio facilities. 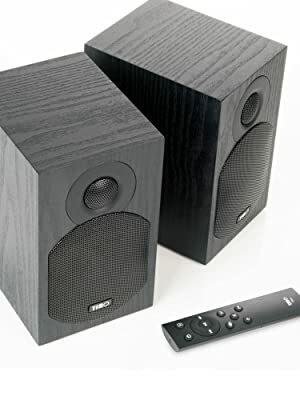 1 | hi-fi active bluetooth speakers with remote control | rca/ optical inputs | 2 x 35w | black” are described as ‘bookshelf speakers’, avoid occupying floor space, but can easily be placed on suitable shelves or a table within reach of a mains socket to power the main unit. Dimensions are 130 x 185 x 223 mm, able to fit on all but the slimmest shelf. 5 kg, the powered unit responsible for most of that. Each speaker comprises a 32 mm soft-dome tweeter and a 100mm woofer unit that presumably also provides its mid-range coverage. Bass reproduction is somewhat limited by the relatively small woofer and by the frequency handling capabilities of bluetooth, effectively limiting them to cd quality (but only just). There are currently three models in the tibo plus active bluetooth speaker range – 1. All three have the same black finish and black metal grill to the front. 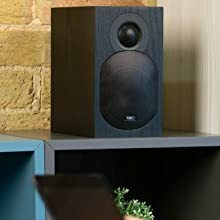 1 speakers measure 19 x 23 x 13cm (height x depth x width) and have two speaker units – an 75mm bass and 25mm treble, and a slim bass reflex port at the rear. The controls at the rear of the powered speaker are volume, optical input, line in (3. 5mm input), rca inputs, and power on/off. The main speaker is plugged into the mains and then connected to the passive speaker with standard speaker cables (supplied). 1 bluetooth speakers from tibo are great for placing next to a tv to improve the sound. The speakers come in a large box with a remote, mains plug, small instruction booklet, speaker wire and phono to headphone cable, pretty much all you need to connect them up. Setting up was easy; attach the speaker wire between the speakers, plug into the mains on the active speaker and switch on. The blue light on the front will flash showing you can pair. I used my lg 4k tv to pair by going in to the sound settings and choosing bluetooth. Crisp, clear sound with a good bass. You can add a subwoofer but, to be honest, you don’t need to as the bass is pretty good on these as it is. As well as tvs, these can be paired to any bluetooth device, like a tablet, phone etc. Note this is a review for the 2. These are effectively monitor speakers – used for monitoring sound studio recordings. The sound quality is spot on. However, it’s very much a case of perfect mid-range and perfect treble, but the bass, though there, is insubstantial. Wall mounting might help the bass though, to give more reflectance (leaving a gap at the back for the ports). For this review, i used my favourite input device and music – a shanling m0 player, with flac (lossless, not mp3) recordings – i. Genuinely cd quality recordings through a decent bluetooth device made for the job. Paolo nutini are out of this world, as is martin taylor’s jazz guitar. Just don’t expect a deep rumbling bass. These are not bose speakers that produce an exaggerated but enjoyable bass from small boxes. They are like monitor speakers – accurate and perfect in their chosen range. These speakers definitely deserve 5 stars. The sound quality is amazing especially for small speakers. Very pleased with the product. There’s plenty to like about these speakers. They offer a variety of outputs so quite flexible with sound setups. They work seamlessly over bluetooth with quick connection and quite a good range. 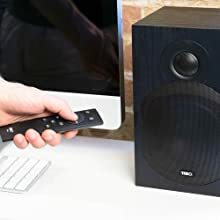 One speaker is powered and the other passive with wires to connect from the powered speaker to the passive one that are a good length so you can space your speakers out quite far if you need to. However i do find the power cord a bit short at about 1. 5m which means the powered speaker has to be fairly close to a power source (it uses standard 3 pin plug not usb connection). 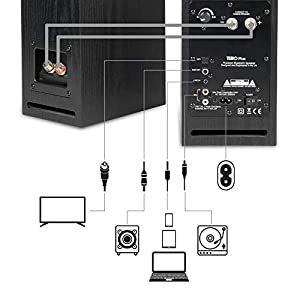 On the back of the powered speaker are various connections including rca, sub out and line in. 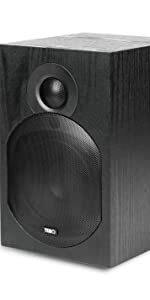 The speakers offer 4 presets – pop which i think lacks punch as it favours treble; classical which i think sounds a bit muffled; neutral which sounds rather flat; and my chosen preset which is rock, that provides the most rounded sound in my opinion with good balance of bass and treble. The sound is perhaps still a bit muddy on whatever the chosen preset is and i’d prefer a bit more clarity as sounds can blend into one a bit but overall i’m satisfied with my chosen preset. Sound quality is generally good overall but not amazing as a result. Nice well built bookshelf size speakers. 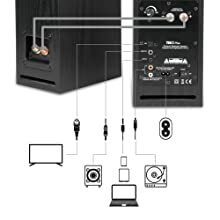 Very versatile usage options, bluetooth (iphone etc), phono connections for hi-fi or tv, dvd player etc and even an optical link for tvs. I plugged them together (one speaker is un-powered, so connect with the given speaker wire) and add the other to your system with the plethora of connections on the back of the ‘powered’ or active speaker. These make great tv speakers, most lcd / led tvs have tiny awful speakers. I used them as bluetooth connected speakers from an iphone. Now i know how to pair speakers with bluetooth, however the slim manual fails to tell you that entirely. It does give a link to the manual, this is a page 404 (does not exist)but you can find it by searching in google for tibo-electronics and then search under products for the plus 1 range, it’s not quite the right manual (2. 1), but it will work with 1. 1i have e-mailed the company to fix it. They should employ me to proof read their blurb. Update the company will fix their silly dead web-links and include bluetooth connectivity guide – but in the futureat least they respond to criticism, gotta give them that and fast. Cannot wait? :1) press input on the remote till it says bluetooth mode – it speaksthe blue light flashes to show it will connect – pair with your phone under the bluetooth menu, the speaker name is shown. For the price, the tibo plus 2. 1 hi-fi active bluetooth speakers are good value for money. At the moment, i am using them mainly as bluetooth speakers for my iphone, but i have also connected them to my pc, to use when watching films / streaming etc on my pc. 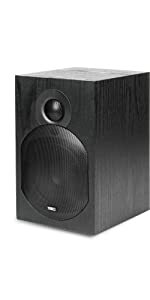 The speakers look good and come in a black wooden finish. 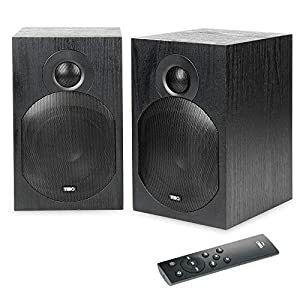 The sound quality is good – they push out a good volume for the size, and the bass response is ok, but you might want to invest in a sub-woofer (there is a connection for this). These speakers give a much better sound than the small speakers with my pc, and the bluetooth connectivity is an added bonus. The only negative point is that the printed manual is pretty poor – if you want more depth (including how to connect to bluetooth), you will have to google the manual. 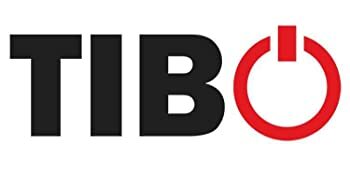 TIBO Limited was founded back in 2010 in Bedfordshire, United Kingdom. In 2017 new offices were opened in Denmark and France to extend TIBO across Europe. TIBO’s Smart Audio range takes listening to a whole new level. Beneath the beautifully crafted surface of each individual product lies cutting edge, innovative technology that delivers music wherever, whenever its wanted. TIBO Plus range. Simply pair the speakers with your Bluetooth enabled device and stream your music library, internet radio, or services like Spotify, TIDAL etc. in CD sound quality. Simply pair the speakers with your Bluetooth enabled device and stream your music library, internet radio, or services like Spotify, TIDAL etc. in CD sound quality. TIBO Plus Bluetooth speakers also come with standard RCA and 3.5mm connections to connect just about any Hi-Fi source. For TVs, CD/DVD, game consoles, and Blu-ray players there is an optical digital input. Can be added to a smart home audio set-up by adding a TIBO Bond Mini, part of the TIBO Ecosystem You will be able to stream Worldwide digital internet radio via your own Wi-Fi and presets for easy access to your favourite radio stations and online playlist. You can listen to music from just about any source – even via wireless Bluetooth using the TIBO Plus range. Having owned and tested many portable blue tooth speakers, i was curious to do a comparison against these mains powered tibo plus 2. The speakers were very easy to set up. 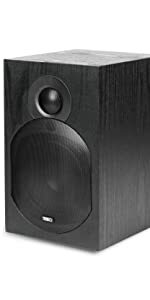 The main unit houses the amplifier and all connectivity ports and the second speaker connects to it via a supplied 8ft length of speaker wire. Amongst other things on the rear of the main speaker is a mains on/off switch and a master volume control knob. I used amazon prime music streamed from my p20pro to test the speakers. Pairing was very straight forward. The speakers appear as tibo plus2. 1 when you initially connect. The sound from the speakers was brilliant, by far out classing the higher end portable models, but in fairness to the portable speakers, these are fully mains powered and as such, should offer a better performance – which they deliver on. Beats Powerbeats3 Wireless Earphones – : TRY ALL THE EAR BUDS!!! Please read!